This quality swing arm tilt bracket is perfect for mounting LCD / Plasma TV's or Monitors in bedrooms, games rooms, offices or anywhere else you need to mount a screen on the wall! The strong extension arm enables you to extend the screen up to 410mm from the wall and can swivel 180 degrees horizontally to achieve that perfect viewing angle for your room. This quality bracket is perfect for mounting LCD TVs or computer monitors in bedrooms, offices, games rooms, or anywhere else you need to mount a screen on the wall! The strong extension arms allow you to pull the screen up to 410mm away from the wall and swivel it to the left or right. This bracket also allows you to tilt the screen up or down to suit your viewing angle or avoid reflections. 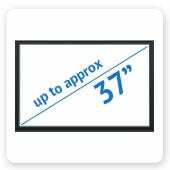 - For screen sizes up to approx 37 inches measured diagonally. 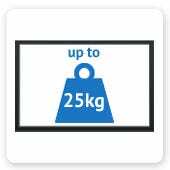 - For monitors weighing up to 25kg each. 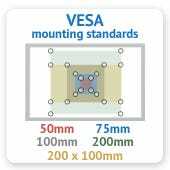 - Fits VESA mounting standards 200, 200 x 100, 100, 75 and 50 (ie: screw holes that are 200 x 200mm or 200 x 100mm or 100 x 100mm or 75 x 75mm or 50 x 50mm apart). This TV mount is fantastic, so easy to install and really solid. I got a much better bracket than I bargained for!